How to model nodes in STAAD.Pro? Previous Topic: What are nodes, beams and plates in STAAD Pro? So, now that you know what is STAAD Pro. and how to start a model in it let us learn to create a model by creating nodes. In next topic you will be learning the creation of beams. 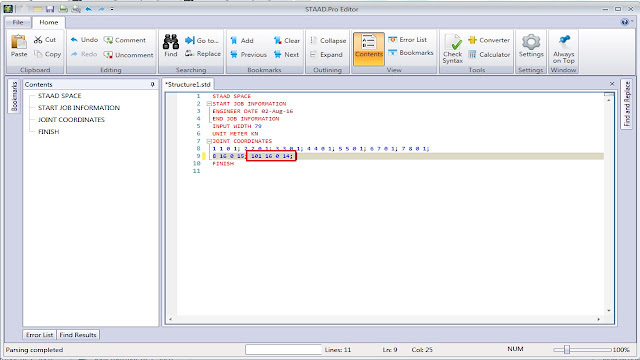 To know what are nodes, beams and plates in STAAD Pro. follow this link. Nodes can be created in many ways, let us learn one by one. Create nodes on snap node grids. Once you start a new model with add beam option, you will be directed to snap node beam with default grid. Click on edit to edit the grid. you can set the grids as per your architectural center lines or column positions. add spacing as per your requirement. make sure the origin at 0,0,0. Hold down the CTRL key and place the nodes at the intersections you want. the node placement courser shall come only when snap node/beam is on. you can read out the instruction at the bottom left to understand how it works. Once you have placed the nodes, close the snap node/beam window. you can find the Snap node/beam window again from Geometry --> Snap/grid node --> beam. 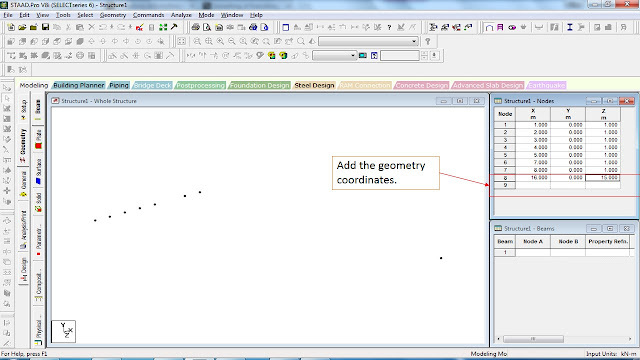 Typing node coordinates in geometry panel --> nodes table. The picture below is self explanatory. Typing node coordinates in Input window. "Node number" "Space" "X coordinate" " Space" "Y coordinate" " Space" " Z coordinate" ";"
Other ways of creating nodes are by creating one node and copy pasting it in x,y,z, directions or using translation repeat. Watch this video to know it better. Next Topic: How to create beams in STAAD Pro?